The internet age. This description is already obsolete. This age is passing quickly. The cloud computing world is now. When wandering about in the cloud of information, things are not recognized clearly for what they are as each bit of information is not clearly defined in either its characteristic or identity. In the cloud computing world, we can know “IT” without actually touching anything real. If we type a keyword in any search engine, we get the information we want quickly. Sports car, British car, SUV, Jaguar, Land Rover, and so on. In the clouds, we have already discovered what we need to know about the goods we desire to purchase. But they are not yet physical, just virtual. So we need specific places where we can touch them directly, like this showroom. People should make the final decision after wandering in the clouds. So, in the showroom, goods can fascinate people strongly. They make a bigger impact in the real world. The space should be a specific space to enhance the attraction of the cars. So, I adopted the psychological meanings of showcases. Glass is transparent and through it we can see the object on display inside. But we can never touch it from the outside. So the goods inside become exclusive, and we can feel the special Value of them. Hakko is one of the biggest dealers handling European cars around Osaka, specializing in Jaguar, Land Rover and so on. This showroom is their first showroom in Kyoto. In Kyoto stricter restrictions for the cityscapes was introduced about 6 years ago. It enforces many details on the façade and roofs. For example, the top of the façade should be a banked, traditional roof. The color should be calm like old Japanese houses and so on. The height is also limited. The regulation was established with the aim to raise minimum standards of the newly built architecture in this old city. So, the enforced items are rather strict about their aspects. But the real purpose of this new regulation is to make the new buildings fit the traditional city atmosphere. So, we tried to make modern architecture that integrated with the surrounding environment. I hoped the façade would seem to melt into the street side trees. So we designed the façade to appear as if the main volume is floating and consists of stacked, separated layers in the green leaves. The distinct layers of glass and gray bands really disappear into the greenery like electric wires. Thus, making people feel the lightness of this showroom is very important. We intentionally created the spaces among the gaps of layers. “Shakkei” is the Japanese idea of landscapes in gardens. It is a method of using elements of the surrounding environment as the background. The direct translation of “Shakkei” is “borrowed scenery”. Of course this idea is efficient for creating a splendid landscape without actual Spaces. We adopted this idea to create the showroom. Specifically the show room and the maintenance space draw the green scenery of the street side trees into their spaces. Customers will look at cars with such greenery as a backdrop and hold negotiations for their favorite cars beside the splendid scenery. We designed the first floor as a thin, floating slab on which the inner circumference of the atrium feels organic, implying movement. It is sloping down to the ground floor. The glass screen of the ground floor façade also surrounds the atrium acting as another free-flowing curve. But the shape of the floating mass is just a rectangle without extra meaning. It gives a sense of lightness. 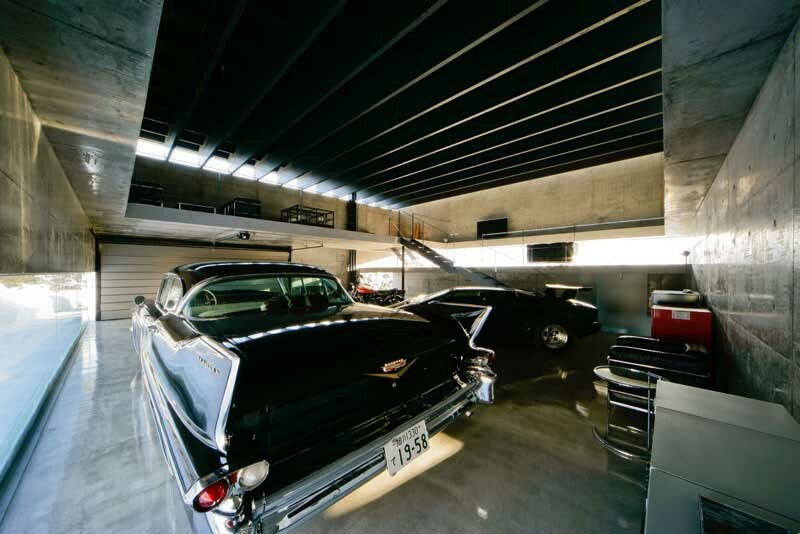 The maintenance area is designed as the place where owners will stay with their cars, which will be serviced in front of a green screen, enjoying comfortable breezes. A facia surrounding it will be open along its whole length. The wind will flow through the space. It is comfortable even without air conditioners. On this site there was a hotel with an underground automatic-parking facility. The depth is about 20 meters. And the hotel resisted the earth pressure from the eastern cemetery, whose ground level is 5 meters higher than that of the new building. Upon first designing the structure, we had to consider how to demolish the existing buildings with the fear of the cemetery collapsing. But a Japanese proverb says, the location beside the cemetery is appropriate for merchandising. On the other hand there is a kind of deity located at the southwestern side on this site. We call this kind of deity “Ojizo-sama”. It is just like a fairy and is a guardian of children. When a young child dies in an unfortunate accident, Ojizo-sama will be established with his small house beside the road. So, we respect him as a guardian deity, and we have to preserve both him and his house throughout the demolition and the construction. Thus, I tried to design this showroom as a floating volume because of the variety of conditions related to the ground level, and composed this ethereal mass of several layers which weaken the strength of the mass and make it melt into the environment, into the green leaves.